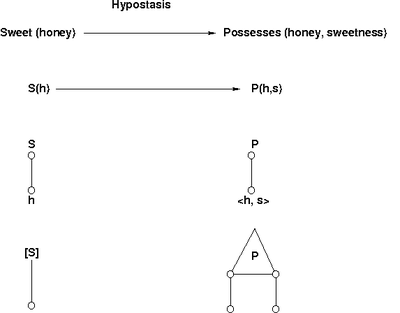 Hypostatic abstraction in mathematical logic, also known as hypostasis or subjectal abstraction, is a formal operation that transforms a predicate into a relation; for example "Honey is sweet" is transformed into "Honey has sweetness". The relation is created between the original subject and a new term that represents the property expressed by the original predicate. Hypostasis changes a propositional formula of the form X is Y to another one of the form X has the property of being Y or X has Y-ness. The logical functioning of the second object Y-ness consists solely in the truth-values of those propositions that have the corresponding abstract property Y as the predicate. The object of thought introduced in this way may be called a hypostatic object and in some senses an abstract object and a formal object. The above definition is adapted from the one given by Charles Sanders Peirce (CP 4.235, "The Simplest Mathematics" (1902), in Collected Papers, CP 4.227–323). As Peirce describes it, the main point about the formal operation of hypostatic abstraction, insofar as it operates on formal linguistic expressions, is that it converts an adjective or predicate into an extra subject, thus increasing by one the number of "subject" slots -- called the arity or adicity -- of the main predicate. The grammatical trace of this hypostatic transformation is a process that extracts the adjective "sweet" from the predicate "is sweet", replacing it by a new, increased-arity predicate "possesses", and as a by-product of the reaction, as it were, precipitating out the substantive "sweetness" as a second subject of the new predicate. The abstraction of hypostasis takes the concrete physical sense of "taste" found in "honey is sweet" and gives it formal metaphysical characteristics in "honey has sweetness". Peirce, C.S., Collected Papers of Charles Sanders Peirce, vols. 1–6 (1931–1935), Charles Hartshorne and Paul Weiss, eds., vols. 7–8 (1958), Arthur W. Burks, ed., Harvard University Press, Cambridge, MA.